Just how wonderful are wonderful shoes? These shoes were my shoes for working in an office full of lawyers, attorney secretaries or administrative assistants, and major suit-lovers. 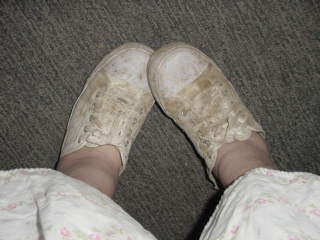 I mostly wore my tennies with nice church dresses and these shoes were very white-white, mule Converse tennies. Cheap, doesn't even describe them, they were a whole $3 dollars. They fit perfectly and even have great support on my non-existent arches. I no longer work in an office and everything I really work at, is outdoor; in the yard, petting horses in the horsepens, milking goats, kicking rocks, (not on purpose) have been an adventure for the both of us, my shoes and me. I've cried in them, I've actually washed them a lot, I've laughed-'til I hurts, in them. I will NEVER throw them away. I'm in my nightgown in the picture with them on. No telling how many germs must be on them and they might smell. Don't ask anyone, please. I don't ever want my thoughts to go there--thinking my favorite shoes have a smell. It would be wise for me to write that we do own bucks, goats that are boys, in rut. They smell. My shoes do not smell like buck, thank you very much! My semi-white shoes are great to fly in (I don't fly, I mean, like go in an airplane), easy to slip off. My children think I'm so nuts that maybe I fly on a broom at night. Not funny! My dear shoes go with socks, hose, and never need tying. I have knotted them. The very best thing is if I trip or a large animal steps on my foot; like my husband--my foot slips right out--shoe stays squished. They have saved me from injury, given me comfort, and when the baby goats, sheep, and puppies smell my tennis shoes they know mommy is here. Kiely, too. lol You know me...I could talk about this forever. I could even clog to Riverdance in these shoes. (that's not true, but in my dreams) Yes, Larin, you CAN call them my basement shoes, but you're the only one. Now ya'll know why I wear those knarly, yellowed, dirty, but clean...Oh, my! They are cross-trainers--they do everything! This new blog is great, it is a real inspiration for me to get going on mine. So cute. Your flyin like a flylady....I am still in fly baby mode. I love your basement shoes. If shoes could tell a story yours would be a sweet fairtale that your grandkids would want to hear over and over. .....tell me more about "The Tails of the Curious Daphne Goat"....yes tails.